Minimalism is a major key. In fact, I am in the process of developing my minimalist wardrobe. My focus for now is expanding my monochrome pieces. In order to pull off outfits that rely heavily on black and white, experimenting with patterns, prints, textures, and accent hues are essential - all of which are featured in this look. As a Style Guru for CollegeFashionista.com, I explain how this look is inspired by Alexander Wang's Spring 2016 Ready-to-Wear Collection and Tomas Maier's Pre-Fall 2016 Collection. I really love how simple and "everyday" this look is. 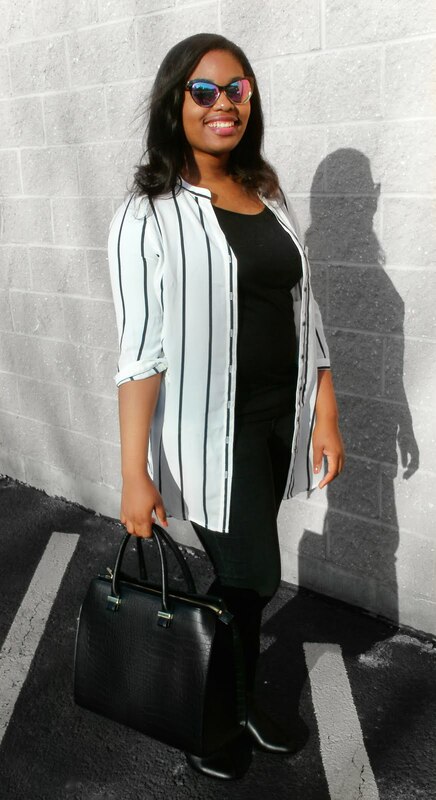 I made sure my vertically striped top was the statement piece of the look by contrasting it with all-black classic pieces: a jersey cotton top, straight leg jeans, and Chelsea boots. Overall, beyond comfortable. I got this handbag in a recent shopping trip to H&M for about $40 and have been loving it ever since. It's extremely deep and holds everything! I'll rave more about it in a separate post. But I love the alligator skin texture of the bag - a subtle detail that makes wearing all black a lot less boring. My ankle boots are from a recent JustFab haul. They pair well with my leather handbag and make the outfit look more polished. Not to mention they're classic Chelsea boots, which pretty much go with everything. This pair works with the cut of my jeans because the top of the boot lands above the hem of my jeans, creating a lengthening affect. I'm absolutely in love with my "Iridescent into Madness" sunglasses from Nasty Gal. The black to silver ombre, the cat-eye silhouette - so perfect. The hues in the reflective lenses were mimicked in my lip color, NYX Butter Lipstick in the shade "Hunk" complimentary of Influenster. A great color dupe is the shade "Thunderstorm". In love with the minimal style you put it together very well ! On my way too to start the minimal trends do you have some tips to share ? !